[tps_footer]Aishwarya Rai Bachchan is rightly the Queen of Bollywood. The gorgeous actress who is a brilliant concoction of beauty and brains still makes a lasting impression whenever she dances. Aishwarya, as we all know, is a mind-blowing performer. The actress was recently present at a reality show to promote her upcoming film ‘Sarbjit’ wherein she did something spectacular. We all remember Aishwarya and Madhuri Dixit Nene’s eye-grabbing song Dola Re Dola from ‘Devdas’. 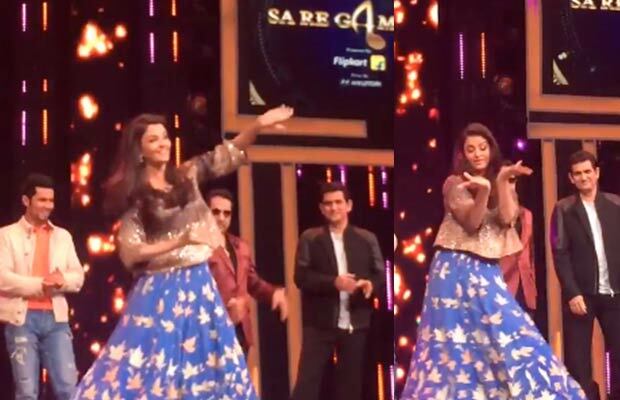 Aishwarya who is otherwise very reserved decided to treat her fans with an impromptu performance. The beautiful starlet danced on the foot tapping tune of Dola Re Dola and the audience could not get enough of her. Looking all enchanting and happy, Aishwarya Rai made her presence remarkable by all means. After 14 long years, the global icon was seen dancing on the track and it was a treat to the eyes. Not only did Ash shake a leg but also star Randeep Hooda and director Omung Kumar joined the gorgeous lady. The film ‘Sarbjit’ will see Aishwarya Rai in the role of Dalbir Kaur (Sarabjit’s sister) and Randeep Hooda will essay the central character of Sarbjit Singh. ‘Sarbjit’ directed by Omung Kumar is a biopic on Sarabjit Singh. The film stars Randeep Hooda and Richa Chadha in main leads apart from Aishwarya Rai Bachchan. The movie is much awaited by the masses for its intriguing plot. ‘Sarbjit’ will hit the screens on May 20th, 2016. Next articleSaif Ali Khan’s Daughter Sara Ali Khan Is Dating A Top Politician’s Grandson?